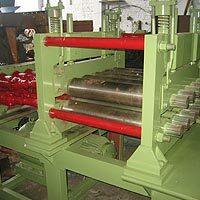 The Multi-Roll Straightening Machines is utilized for straightening the metal rolls. These machines are sturdily developed from the best grade materials and latest techniques to precisely straighten the roll or coil. The machines are known for their unique attributes like precise roll straightening, sturdy design, energy efficient, long service life, high mechanical strength, high straightening tolerance, excellent performance with two electric motors, improvised productivity, silent operation and suitability with all thickness range.